Terriers rallied three times and tied #13/14 Northeastern, 5-5, at Matthews Arena in the first game of a home-and-home series. Five different players found the net for BU: Logan Cockerill, Patrick Curry, Joel Farabee, Bobo Carpenter and Chad Krys. Max Prawdzik got the start in goal but that didn’t last long. The red-shirt junior, who “looked a little nervous,” according to Coach Albie O’Connell, gave up a goal to Grant Jozefek on the first shot he faced two minutes in and another to Bobby Hampton a minute later. O’Connell responded by replacing Prawdzik with Jake Oettinger. BU would cut the Husky lead in half on Cockerill’s shorthanded breakaway goal late in the first period and Curry’s redirection of Kasper Kotkansalo’s blueline blast three minutes into the second made it 2-2. Patrick Schule’s unassisted goal restored the Huskies lead, which held up through two periods, despite BU’s 21 shots in the period. Early in the third, BU scored twice to take its first and only lead. Patrick Harper, from behind the NU cage, found Farabee in front and he roofed the puck past Cayden Primeau. Just over a minute later Carpenter redirected a David Farrance shot to make it 4-3 BU. Jozefek’s second goal, on a two-man advantage, re-knotted the score and Schule’s second goal gave NU a lead for the third time. After failing to convert on its first six power plays, Krys’ one-timer from inside the blue line, after passes from co-captains Carpenter and Dante Fabbro, pulled the Terriers even and gave BU its second man-advantage goal of the season. 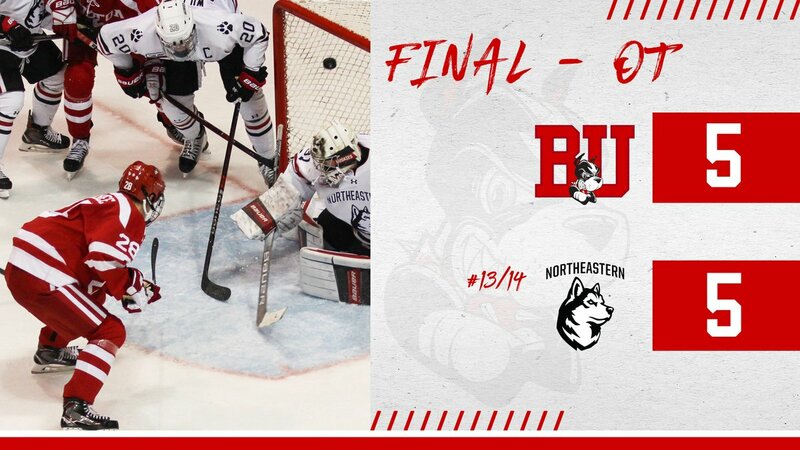 Adding four shots in a scoreless overtime, BU finished with a season high 50 shots while Northeastern had 34. 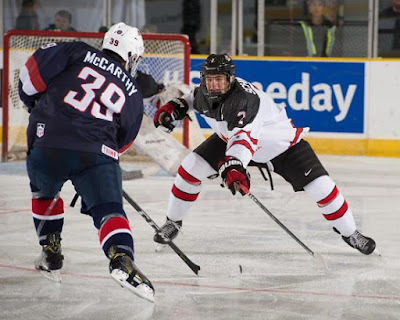 2019 recruit Case McCarthy assisted on two goals and Trevor Zegras recorded one helper in the NTDP U18s’ 6-4 loss to USHL Muskegon. The loss was Team USA’s first since dropping a 5-4 overtime decision to BU and its first USHL loss of the season. Zegras has 14 points in the past six games. Alex Chiasson scored his fifth goal in the last six games in Edmonton’s 4-0 blanking of the Blackhawks. Former captain Wade Megan was recalled to the Red Wings and made his NHL season debut last night in a 4-3 win against the Devils. Megan, who had played four games for the Blues and had scored his first NHL goal for them, previously had a 2-2-4 scoring line for AHL Grand Rapids. ● NHL.com Megan excited to join Wings.